Virtual reality is a great way to experience video games on a whole new level of immersion, and several VR platforms are available for consoles, PC and yes, even Android. Are you ready to challenge your perceptions of what a mobile game can be? These are our recommendations for the best VR games for Android. This article covers the three current VR platforms used with Android smartphones, with games recommended for each platform. If you use the Oculus Go, the standalone headset that doesn't require a phone, we've also got you covered for the best apps and games for Oculus Go. 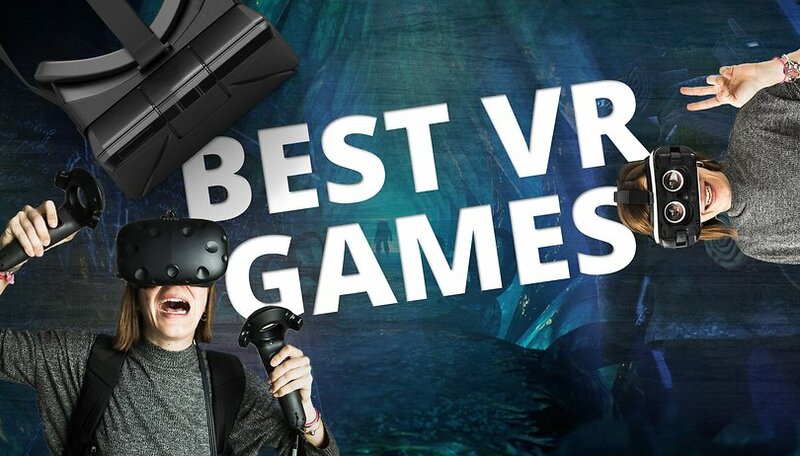 If you have a headset that connects to your PC, be sure to check out our best VR games for PC. Google's own Daydream VR platform expands Cardboard to meet specifications required of smartphones and headsets in order to play more complex VR-compatible apps. The Daydream platform is accessible via the DayDream View headset and smartphone, or with the standalone Lenovo Mirage Solo standalone headset. Meta, much? Virtual reality was originally a Daydream title, but has met with such success that it has since been ported to the Gear VR, Oculus Go, and Steam for users of the HTC Vive and Oculus Rift. V-VR posits a future in which the robots have taken over, and humans are reduced to working as servants to our machine overlords. Assuming the role of one of these assistants, you must complete various tasks for your employers, or rebel against them if you so choose. Over the course of the game's many levels, you'll don virtual VR headsets, teleport to different bizarre worlds, and complete various challenges while enjoying (hopefully) the game's absurd humor. A must try for any VR gamer. The name Rez may bring some nostalgic joy to old-school PlayStation gamers who experienced the original psychedelic rhythm game, and the current VR-compatible incarnation is even more immersive and entrancing. This on-rails shooter was ported over from PC with very little sacrificed in terms of visuals and gameplay. On Google Daydream, especially on the Mirage Solo, Rez Infinite is an absolute feast for the senses. There's not much in terms of levels apart from seeing how long you can survive against increasingly difficult enemy waves, but given that the game costs nothing, it still stands out as one of the best free VR games out there. It's always high noon, somewhere out in space. Arcslinger is a colorful sci-fi/western mashup arcade shooter that has you draw a cyber-six-shooter and defend against waves of weird and wonderful foes that come at you with cleavers, bullets, and dynamite. The player can learn 'Arc magic' powerups to spice up the usual look-click-shoot VR gun gameplay, and the cartoony space western-style graphics look great and definitely skew the game towards a kid-friendly feeling. Mekorama is a puzzle game where you have to guide a small robot through the level. In the beginning, it's fairly simple because usually only a few stones have to be moved, but the difficulty increases significantly from one level to the next. In the VR version, the action appears all around you, as if you were shrunk and placed into the game world. You use the controller to move the stones and show the robot which way to go. Action is hot with Hunters Gate. The world has been attacked by demons and you have to keep them back in this action-packed rolling game – to save the world, as per usual. This is a fun and graphically impressive game. Rolling game elements make your character grow stronger over time and learn new skills. Thanks to the Daydream controller, you quickly get used to the controls. You can look at what’s happening from above, which is good for playing comfort – you don't have to face too much virtual movement. The sensation of speed made possible by Virtual Reality make it particularly suited to racing games. Need for Speed: No Limits VR is probably the best racing game for Daydream-capable smartphones. Great graphics and breakneck-pace races guarantee an exciting ride, but what makes the VR experience with Need for Speed complete are the detailed options for customization and car tuning. EA has paid attention to detail: At the beginning you can even adjust the height of your seat. Gunjack 2 is a VR shooter that has you play a mercenary on the Kubera mining platform on the outer edge of our solar system. Your mission: to fend off attackers, because pirates are desperate to steal those minerals. So you sit at a cannon and blast the attacking spaceships to smithereens using the immense arsenal of weapons at your disposal. The controls are a little bit tricky to get used to. The game is action-packed and fast, but you control every move with your gaze. Developed in cooperation with Oculus, the Gear VR is a powerful system compatible only with high-end Galaxy smartphones. If you've got a Galaxy S7, S8, S8+, S9/S9+ or Note 8 or Note9 phone, Android version compatibility is a non-issue. Rangi is a beautiful puzzle game with an aesthetic informed by African tribal art, architecture and music. The music is particularly delightful throughout the game. In Rangi, you have a sacred quest to restore the power of the Music Giants and restore rhythm to the world. But it's not a dance-off. Instead, to complete your goal you'll have to Rangi, you’ll solve dozens of complex puzzles and explore hidden temples replete with tricky traps, in a classic pulp adventure style. The difficulty balance of the puzzles is fair and the distinct art direction keeps the game fresh and engaging in a crowded market of puzzles. All for the not-bad-at-all price of $5. End Space is probably THE definitive VR space fighter thanks to its gorgeous visuals, immersive environment, and fleshed out sci-fi story. As well as being on Gear VR, this popular action game is also supported by Oculus Rift, PSVR and Oculus Go. The total freedom of movement in a VR space can feel somewhat disorienting, but once you can navigate your Minos Starfighter, you'll be feeling like a hotshot pilot in no time, blasting your enemies into space dust in the game's beautiful environments. The cost of this premium mobile VR experience? 7 levels of action for $7.99. VR might seem like it should isolate you from the outside world, but this game turns that assumption upside down. A fantastic local multiplayer/co-op game Keep Talking and Nobody Explodes uses the isolation of VR and turns it into an integral part of a hilarious social experience. The player with the headset on is faced with a randomly generated bomb covered with wires and buttons – and your nearby friends (without headsets) are looking at a manual, either printed out or on another screen, and must talk you through the disarming process as you describe a bomb that they cannot see. Want to know off your Gear VR at a party? Don't be anti-social, here's how to do it. Anshar Wars 2 is a graphically impressive VR game. In this game, your little fighter battles in space for victory. This action game is a lot of fun because the 360-degree effect of the Gear VR works very well. However, you should also connect a game controller to your smartphone otherwise it quickly becomes uncomfortable to control. Land's End, by Monument Valley creator ustwo, is more for fans of puzzle games. Designed especially for the Gear VR, in this game you awaken in an old civilization. You do not need a controller because ustwo has devised its own operation. Graphically, Land's End is abstract; the virtual landscapes are inspired by many remote parts of the earth. Action-lovers will not be happy with this one. Like many other Gear VR games, Land's End also costs quite a lot. The developer is asking $7.99 for it. Wands is a VR multiplayer game set in a magical version of 1880s London in which you play a so-called Wielder. You'll equip your wand with elements that allow you to cast spells such as fireballs, lightning bolts and meteor attacks. Movement in the game only takes place via teleport, otherwise you aim by means of head movements. There is no real story - instead, Wands focuses on battles against other players. Before fighting real opponents via the Internet, however, some training is recommended - both to familiarize yourself with the controls and also to find stronger spells. Operation is either via game controller or Gear VR touchpad. The new Gear controller is also already supported. Wands costs $5.99 at the Google Play Store, where it supports Daydream but it's currently on offer at the Oculus Store. With an isometric tabletop view reminiscent of classic point-and-click PC gaming, Augmented Empire stands out from the crowd right from the get-go. But aside from its visuals, this turn-based tactical RPG is also distinguished by its well-developed story. You direct a party of 6 misfit characters through a dystopian cyberpunk city that has descended into Victorian-esque levels of inequality and dysfunction, uncovering a surprisingly deep plot along the way. Augmented Empire proves that top-down RPGs have a future in VR. Rich storytelling and top-notch voice acting make Augmented Empire one of the more satisfying VR games out there. Although the controls and mechanics are relatively intuitive, a controller is recommended for the best experience. With hours of gameplay, Augmented Empire is a bargain at $9.99. Cardboard is Google's ultra-low budget solution for entry-level VR. Most Android phones can run cardboard apps, and viewers are often available for just a couple of bucks or given away for free. The VR game market is crowded with shooters and on-rails experiences, but Whispering Eons does something different. It's a story based adventure game set in a cyberpunk future (and let's face it, there's probably more than a little crossover between VR and cyberpunk fans). Whispering Eons has a decent plot, immersive music and tons of atmosphere, and is completely free, without even ads to mar your experience. The only downside is that it's quite short, but hopefully the developer will follow up this "episode 0" with a full-fledged series. I'd recommend anyone getting started with VR gaming on Cardboard to try out InCell VR, an action game set in the intriguing environment of the human cell. Not only does it offer an unusual setting with fantastic visuals, but it's specially designed to work with Cardboard and I've only ever had a smooth experience on it. The more trigger-happy VR novices should try VR Galaxy Wars, which has you control a futuristic turret out in deep space, blasting enemy ships into smithereens with only quick reflexes and your gaze. Honestly, there's not much more to it, but the more grounded feel of piloting a turret rather than a spacecraft means that it's less disorienting, and you don't have to worry about navigation. Minos Starfighter is basically End Space, but trimmed down for Google Cardboard. As such, it's not quite the quality of what you'd find playing the game on Oculus or Gear VR, but is still one of the best action titles you can get on cardboard. Endless runner games are very well suited to being played with VR glasses. Lamper VR: Firefly Rescue, the successor to Lamper VR: First Flight, is such a game. Here, through head movements you control a small firefly and you have to free your firefly friends who were lost when spiders attacked your insect kingdom. In the game, you fly through forests and caves, shoot down fireballs and use power-ups to defeat opponents. This works very well thanks to intuitive controls. Not only does it look stylish – it's also free. Lamper VR: Firefly Rescue is available for free in the Google Play Store. There's also a version for Gear VR, which costs $2.99. Space. Infinite ways to go. No wonder that VR games often take place in space. In VR Space: The Last Mission you are - as usual - the last hope of humanity. Also as per usual, the story is mainly an excuse for action. The crucial thing is that you repel the many attacks of enemy spaceships. And that's more than enough for an entertaining experience - especially since the graphics are so impressive. Although the game is designed for cardboard VR glasses, there is a NoVR mode that transforms the game into a classic smartphone game. Which VR games do you like? We're looking forward to your comments. I would like to see more VR racing games.